CodeIgniter is a powerful PHP framework for rapid development. It is an opensource PHP framework build by developers for developers to create web application faster. CodeIgniter 3 is the latest framework available and CodeIgniter 2 is legacy PHP framework. In this tutorial, we are going to install CodeIgniter 3 on our system. This tutorial will help you to install CodeIgniter on Ubuntu 18.04 Bionic LTS systems. Download the latest version of CodeIgniter from its official GitHub release page. 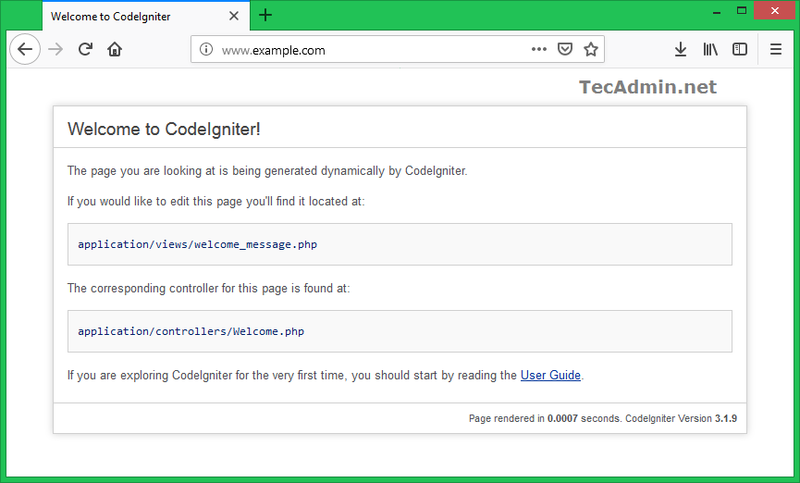 You can use following commands to download CodeIgniter 3.1.9 on your system. Extract the archive on your local system and place directory for document root with proper naming. Now, create a database for your CodeIgniter application in MySQL. I have MySQL 5.7 running on my machine. Connected to MySQL with root user then create database and user with below queries. Ater creating database, edit the CodeIgniter database configuration in text editor and update the database settings as per your environments. Now you need to configure the base URL for your application. For this tutorial, I am using www.example.com domain for configuration. You can choose localhost or any valid domain name of your choice. Save the Apache VirtualHost configuration file. Now use the a2enmod command to enable newly created CodeIgniter VirtualHost. Also, restart Apache service to apply changes. All done. You can access your CodeIgnator application in your favorite web browser with the configured domain name. By default, you will the screen like below. Let’s start developing with CodeIgniter.